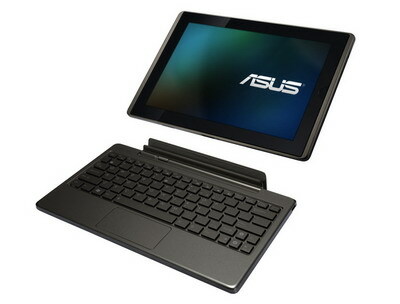 In addition to 7.1-inch ASUS Eee Pad MeMO tablet, and 10-inch ASUS Eee Pad Slider, ASUS has also announced another Android 3.0 tablet called the 'ASUS Eee Pad Transformer'. With a slim lightweight design and 10.1-inch capacitive touch-screen and Android 3.0 Honeycomb, the Eee Pad Transformer boasts the NVIDIA Tegra 2 chipset that provides full support for Adobe Flash, smooth HD video conferencing and playback, a lightning fast web experience and incredible mobile gaming performance. An optional docking station turns the Transformer into a full-fledged notebook with a QWERTY keyboard for desktop use, while extending battery life up to 16 hours. As with the Slider, front (1.2 megapixel) and rear (5 megapixel) digital cameras make for easy video chat and digital photography, while a built-in mini-HDMI port makes for easy connections to external displays showing off full 1080p HD video playback. 0 comments on "10-inch ASUS Eee Pad Transformer Android 3.0 tablet unveiled"